New York (TADIAS) – After a successful five-year term as the head of the African Economic Research Consortium (AERC) — a Kenya-based non-profit organization that conducts independent research concerning the management of economies in sub-Saharan Africa – Professor Lemma W. Senbet, an internationally recognized leader in finance studies has returned to continue teaching at the University of Maryland, College Park. In 2015 under his leadership AERC received the highest possible rating as the most transparent think tank in the world. According to a report released by Transparify AERC was one of 31 major centers of research worldwide, out of 169 examined, that was given a five-star rating. The list included several American policy research establishments such as the Center for Global Development, Pew Research Center, Stimson Center, Woodrow Wilson Center and the World Resources Institute. Now back in the U.S. Professor Lemma shares that his next steps involve working with the recently formed Diaspora committee that will help to raise funds for Ethiopia. His background as an economist as well as his non-political, non-partisan and fact-based approach to complex issues will certainly bring a much-needed skill set to the group — which also includes several highly qualified individuals whose work we have previously featured in Tadias such as Dr. Bisrat Aklilu, retired United Nations official; Elias Wondimu, Publisher of Tsehai Publishers; Dr. Menna Demissie, Vice President of Police Analysis & Research at the Congressional Black Caucus Foundation; Mimi Alemayehou, Managing Director of Black Rhino Group & Executive Advisory and Chair of Blackstone Africa Infrastructure; and Obang Metho, Executive Director of the Solidarity Movement for a New Ethiopia and a noted human rights activist. 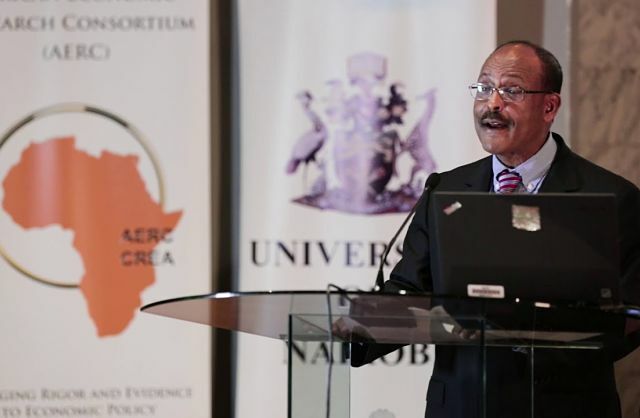 In his departing speech to his colleagues at AERC, Professor Lemma told his audience that he will continue to advocate for Africa once he returns to the U.S. and he has already hit the ground running.